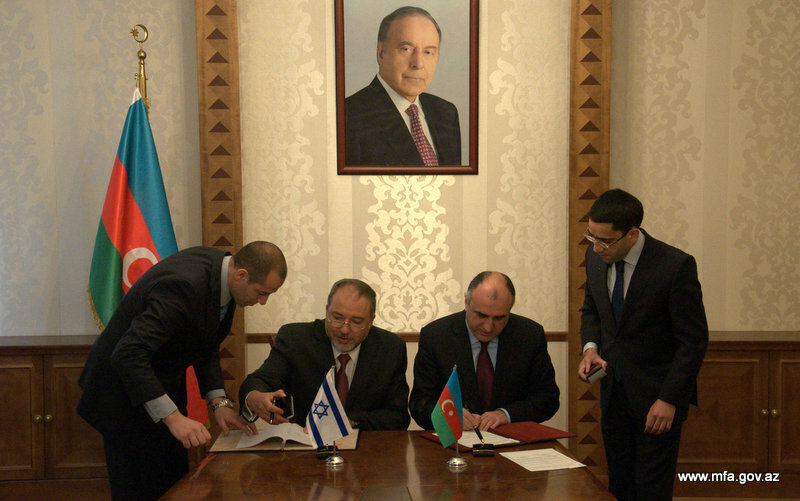 Azerbaijan and Israel signed a protocol on permanent diplomatic consultations following the meeting of Azerbaijani Foreign Minister Elmar Mammadyarov and Israeli delegation led by Foreign Minister Avigdor Lieberman on April 30. During the meeting, the sides expressed satisfaction with the level of relations between the two countries and held discussions on the development of cooperation in political, economic, trade, science, technical and humanitarian spheres. Mammadyarov briefed the guests about the process of negotiation on the settlement of Armenian-Azerbaijani Nagorno-Karabakh conflict, stressing the importance of withdrawal of Armenian armed forces from the occupied Azerbaijani territories. The minister added that the conflict must be settled within Azerbaijan's territorial integrity and sovereignty. Lieberman, in turn, praised the role of the Jewish community in Azerbaijan in the development of relations between the two countries. At the end of the meeting, the sides signed a protocol on permanent diplomatic consultations between Azerbaijani and Israeli foreign ministries. Answering the questions of journalists, Lieberman praised his country's relations with Azerbaijan, saying "It is my fifth visit to Azerbaijan. And I feel myself home." Lieberman noted there are a number of Jewish communities in Azerbaijan, and called them a bridge between the two countries. He also praised meetings of the two countries' presidents as important in terms of expanding bilateral relations between Azerbaijan and Israel. The Israeli foreign minister noted the meetings to be held in Baku would feature discussions on the expansion of cooperation in high technologies, power engineering, and agriculture. Earlier, President Ilham Aliyev received Lieberman. The meeting discussed the development of the bilateral relations between the two countries in various areas, and exchanged views over the development of cooperation in the fields of high technologies and agriculture.